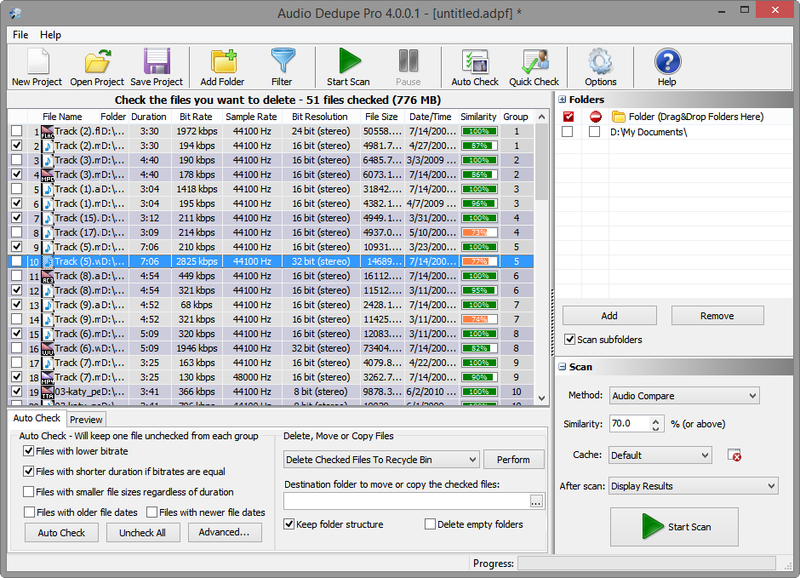 Unlike standard duplicate file finders Audio Dedupe can find similar and duplicate songs regardless of the file format. Audio Dedupe performs real audio analysis and “Listens” to the songs in order to find similarities. It can recognize exact duplicates or even remixes of the same song stored in different file formats. The tool supports plenty of file formats and will put an end to the mess in you music collention, iTunes, iPod, iPad, iPhone or other mp3 player devices. Here are some of the supported file formats: Supports MP3, MP2, MP1, MPA, WAV, OGG, AIFF, AAC, MP4, FLAC, AC3, WavPack (WV), Musepack (MPC) and Windows Media Audio (WMA) file formats. Version 3.1.0.1 provides two new features for managing the duplicates list. “Remove from List” context menu item is added that will remove the selected entries from the list. If the option “Remove groups that contain single file after move/delete” is enabled in the settings removing an item from a group that contains just two entries will automatically remove the group from the list. This option minimizes the chance of removing unique files from the library. The other context menu item named “Remove Group from List” will remove the selected group without deleting any files. This release adds some performance improvements and provides better multithreading support. This means that the resources of a computer will be utilized better in order to provide faster performance. These improvements have higher impact on systems with multi-core CPU’s. Issues related to deleting large amounts of files are now fixed and performance improvements are applied. A problem related to rotated desktops (mostly on tablet devices) is now resolved. A fix is added for better backward compatibility and old project files are now handled without issues. An issue with the manual selection of files (ticking) is now resolved. In certain cases the space bar was not working. An improvement related to to extracting associated file icons is applied which adds also performance improvements. Do you have suggestion or miss a feature? Please comment below. This entry was posted in Audio Dedupe and tagged Abee Mp3 Duplicate Finder, Best Duplicate Mp3 Finder Crack, Best Duplicate Mp3 Finder Mac, Best Duplicate Music File Finder, Best Free Duplicate Finder, Download Find Duplicate Files, Download Find Mp3 Duplicates, Duplicate Mp3 Finder Freeware, Duplicate Mp3 Finder Lifehacker, Duplicate Mp3 Remover Freeware, Duplicate Music File Finder, Duplicate Music Finder, Duplicate Music Finder Downloads, Find Duplicate Mp3 Files, Find Duplicate Songs In Google Music, Find Duplicate Songs In Itunes, Find Duplicate Songs In Itunes 11, Find Duplicate Songs On Computer, Find Duplicate Songs On Ipad, Find Duplicate Songs On Iphone, Find Duplicate Songs On Mac, Find Duplicate Songs Spotify, Find Similar Mp3, Find Similar Mp3 Program, Find Similar Mp3 Software Download, Find Similar Music, Find Similar Songs By Song, Find Similar Songs By Sound, Find Similar Songs On Itunes, Find Similar Songs Online, Find Similar Songs Search Engine, Find Similar Songs Spotify, Find Similar Songs Website, Free Duplicate Mp3 Finder, Freeware Music Duplicate Remover, Music Duplicate Deleter, Similar To Mp3 Rocket, Wav Duplicate Finder on June 13, 2014 by MindGems Support.